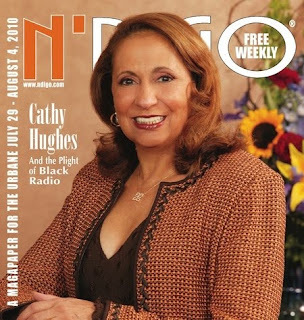 Huffington Post blogger Zondra Hughes interviewed Radio One's Founder and Chairperson Cathy Hughes on the performance royalty tax. Their discussion was on the Performace Royalty tax and the Plight of Black radio. (Is there such a thing as Black Radio anymore?) It is reported that if this tax goes in effect then Radio One will have to fork over at least $14 million. But let me say this, I ain't mad at her, and the reason why is because the record industry, SoundExchange and musicFIRST--according to a source at the White House--they have already spent about $28 million to get this legislation passed. Dionne and them are on the payroll. They are getting like, $200,000-300,000 paychecks, flying on corporate jets, being put up in suites at the hotel. They are getting paid, they are professional lobbyists on this issue. They're saying, "Oh, I'm an artist," and that is true, but you're also getting a paycheck from the record companies to come out here and say this sh**. I'm not mad because this girl doesn't have any other way to make this type of money, other than doing this. So I understand what's causing this and she ain't the problem. Where do you stand on the issue? Check out the article on Huffington Post and be sure to read the interesting comments.